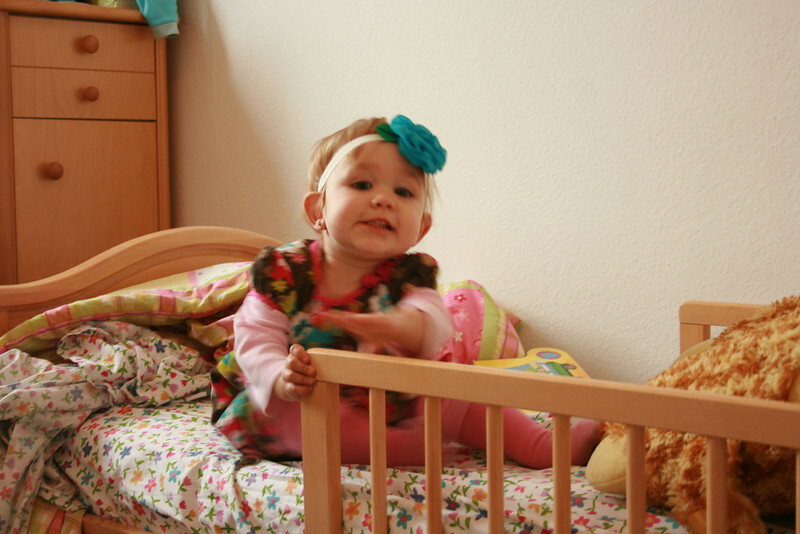 Ask the Mamas: Can I Skip the Toddler Bed? Mama Say What?! | Mama Say What?! Each week we will ask our mamas a question from our readers that pertains to babies, kids, or parenting. Make sure to check back each Tuesday to see their responses! Mama Say What?! Reader Katy F. asks “I think our crib days are coming to a close. A couple nights in a row my son has woken himself up all turned around in the crib with his legs and arms stuck in the bars. He’s tried a few times to get out but he can’t really do it yet. However, he’s such a crazy, wild sleeper that I think he’s just uncomfortable in his little crib. From our personal experience, this isn’t a necessary step. We were taking a family trip to Florida and I knew that the last thing I wanted to do was travel with a playpen for my daughter to sleep in. Two months before our trip, we decided to take the plunge and transition our (almost) two-year-old into a queen-sized bed (it’s what was already in our spare bedroom). We pushed the bed up against the wall, bought a toddler rail, new bedding and made the room over to be hers. She was very excited! This was obviously a big change, and we knew it would take some time to adjust. For the first week, we laid with her until she fell asleep, then the next week we would sit at the foot of the bed. By the time the third or fourth week came around, we would say good night and give her a kiss then let her know we were right in the next room and left her door open so she was comfortable. I’m sure that it would have been a similar process if we had changed the crib to a toddler bed, but I didn’t want to have to do two different transitions. ~Kathy S.
We decided instead of a toddler bed to just use a full mattress on the floor. This eliminated any fear of him falling out, made it easy for him to get in and out by himself, and was big enough for me to lie down with him when he needed it. It was a huge success! ~Laura K.
This was the exact situation we were in when we decided that our son was ready for a big boy bed. He wasn’t climbing out of the crib yet, but he was such a wild sleeper that he often woke himself up bonking his head or getting a limb stuck between the rails. We debated going with a toddler bed, but then nixed the idea knowing he would only be in it for a short time before he outgrew it. I don’t feel like the toddler bed is a necessary step at all. We opted to switch him over to a twin mattress that we placed right onto the floor. He still was a wild sleeper, but if he fell out of bed, he only fell a few inches and very often didn’t even wake up. He slept with the mattress on the floor for almost two years before we put the mattress onto an actual bed. He’s still a pretty wild sleeper, but not to the point where he rolls out of bed, so we were able to skip getting a bed rail. ~Alex T.
We ended up transitioning our little guy out of his crib when he was a few months past two-years-old. He climbed out of the crib once and we no longer felt safe knowing that he could easily fall and get hurt. We toyed with the decision of doing the crib with the side off and the guard rail vs. going straight to a twin bed on the floor. We had a big snowstorm that weekend and couldn’t get out to buy twin sheets (for the mattress we already had) so, we went for the toddler bed! It worked great for about a year (though his naps went downhill quickly with his new found freedom) and we recently took the crib down completely and gave him a twin bed on the floor, which he LOVES. ~Mary Ellen M.
I opted against the crib to toddler bed stage. I knew sooner or later we’d then have to go from toddler bed to twin bed, and figured one less transition would be better. 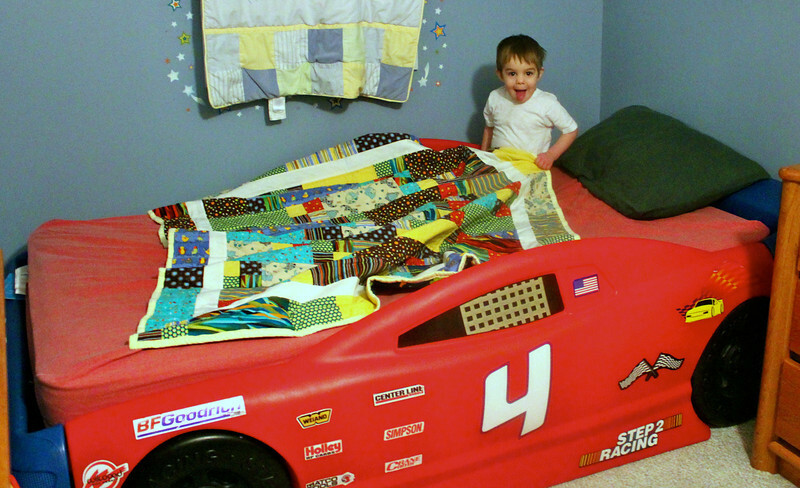 I bought him a really fun race car bed so he’d be excited to sleep in it (great deals on Craigslist btw)! It sits on the floor and has a raised side which made it completely safe. It is also nice that we can both lie in bed for book reading before bedtime. ~April M.
N hated the crib. If I had listened to my gut, we would have transitioned him sooner than we did… but as a first time mom, you second guess yourself sometimes (am I right?!). That said, we transitioned to a full size bed on a low profile box-spring (with no bed frame) when we got rid of the crib. It was easier for all of us. We planned to get a bed rail, but ended up not needing it. Since it is a full size bed we were able to put pillows around him and eventually didn’t need anything. ~Cari H.
Ask the Mamas: How Many Kids? Added by Michelle W. on July 8, 2014. 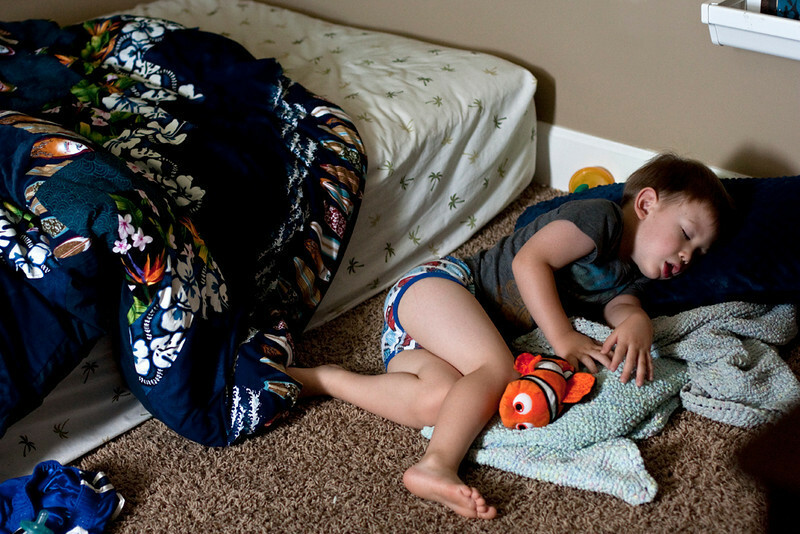 8 Responses to Ask the Mamas: Can I Skip the Toddler Bed? This is great i did this with my second i just went straight to a twin bed plan on doing the same for my 3rd when the time comes. We moved our 20-month-old straight into a bed on box spring on the floor with a toddler rail. Why not? Toddler beds just seem like one more thing I’m supposed to spend my money on. We as well just went to a twin instead of toddler bed. It worked out great for us. we went from our bed to a toddler bed only because it allowed him to be right next to us without being in bed with us. We would have loved for our toddler to stay in our bed but I was too pregnant and he kicks in his sleep. No room for a twin sized bed right next to ours, though! At around 2, we moved my son’s crib mattress onto the floor. For a month or so, the we moved him onto a twin mattress on the floor. He slept on that for about another year, then we moved it onto a box spring. He’s only fallen out of bed a couple times, never used a bed rail. This is great advice. We’ve been starting to think about this issue as our son is 18 months old. We still have some time before we need to take the plunge, but we may end up doing the toddler bed for a while just because we have a lack of space and the crib is already in place; just need to take off the front side. I was planning on transitioning my then 2 year old son straight from his crib to a twin bed. But he fell in love with a certain toddler bed so we got him the toddler bed. I think involving him in the choice made the process much easier.